Transition US has been very busy this past month. The New York Times Magazine and Elle Magazine articles stirred up new interest and activity across the nation. Great new partnerships are developing, new Transition Initiatives emerging and several trainings have been added to the calendar. We also welcome our two new board members: David Johnson and Michael Brownlee. David Johnson David has a Masters Degree program in Transpersonal Psychology with a concentration in Ecopsychology at Naropa University. His training and work with a number of ecopsychologists informed his thinking around the Heart & Soul aspects of Transition. David was involved in a think tank set up by Rob Hopkins in the early days of Transition Town Totnes and recently moved to Portland, OR where he has been in the central group forming Transition Portland. (read full bio). This month, we welcome four new Official Transition Initiatives in the US, bringing the total to twenty-five: Paso Robles, CA, Portland (PDX), OR, San Luis Obispo, CA, Hohenwald, TN. Learn more about the first steps to Transition. Here are a couple of reports from Sustainable NE Seattle, our 19th Transition Initiative, and Let's Live Local, our 11th Transition Initiative. On April 19, 2009, one of the founders of Sustainable NE Seattle, Susan Gregory, along with her husband Joel, hosted a hugely successful worm-bin building "bee" at their home. One of our members who came to build bins, took great photos and blogged about it here. This week we’re meeting with the local US Forest Service to take our next step in preparing a grant that will enable the community to explore potential local uses for woody biomass here. Currently biomass from the National Forest that surrounds us on all sides is either burned or trucked out of the area. We see many potential uses for this resource right here, including manufacture of wood pellets and brickets that are now being shipped in from out of state. Through this program we hope to educate the community on the benefits of renewable energy and woody biomass in particular, get them actively involved in forest stewardship, and create local jobs that will enable people to stay in the area without long commutes to work. Let’s Live Local (Pine Mountain Club's Transition Initiative) will also have a booth at this month’s local Lilac Festival May 16th and 17th. Read more about their projects. "A great thanks for a very informative, useful and heartfelt weekend. It's always inspiring to spend time with people of passion and committed spirits of change for the betterment of all." - Richard B. "I am excited about implementing what we learned with you in Seattle...the role of social engagement and collective decision making seems key to reinventing our future together." - Clive P.
Working in pairs, our twenty-one US Trainers are looking forward to sharing their knowledge and expertise and have been busily making arrangements for Trainings with communities across the country. Learn more about what it takes to host a Training course. 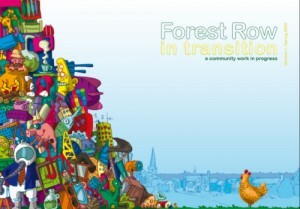 On May 22-24, 2009, about 320 transitioners from around the world will gather at the Battersea Arts Centre in London for the fully-booked 2009 Transition Conference. This is the main event in the annual Transition calendar and is the opportunity to be immersed in what is happening in Transition initiatives around the world. The 2009 conference will be the biggest yet, keeping the best of what has gone before and adding many new and exciting special attractions! Unfortunately booking for the event has now closed. Yes, flying is not encouraged so making the decision to go was carefully weighed but Carolyne Stayton, Jennifer Gray and Michael Brownlee of Transition US will be in attendance and will post conference highlights to the Transition US blog. Stay tuned! "In the film you will see the stories of communities creating their own currencies, setting up their own pubs, planting trees, growing food. You’ll see local authorities getting behind their local Transition initiatives, and get a sense of the scale of this emerging movement. It is a story of hope, and it is a call to action," writes Rob Hopkins. The film is directed by Emma Goude, with production by Smith and Watson, and with input from Transition communities around the world (for the story of the film, click here). The premiere of the film is at the Transition Network Conference 2009 in London, and can also be caught streaming live online here. In the meatime, watch the trailer! Great excitement greets the news that Transition Forest Row has published their Energy Descent Plan! Transition Forest Row is one of the earliest Transition initiatives to set up in the UK (it held its Unleashing just over a year ago), and a year ago they were awarded a grant from Wealden District Council of £5,000 to create their EDAP. The result is a fascinating combination of storytelling, cartoons, drawings and practical steps to an oil-free 2030. Read more. 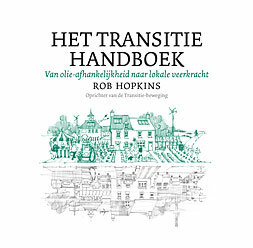 With the release of the Dutch edition of the Transition Handbook, a short new section on economics was added to make it more up-to-date. With the considerable help of Peter Lipman, Jules Peck, Ciaran Mundy and Steph Bradley, here is ECONOMIES IN TRANSITION – Money needs growth and growth needs energy. Feel free to print it out and stick it in page 36 of your Transition Handbook. “Since the first edition of the Transition Handbook was published, huge and far-reaching changes have begun unfolding in the world economy. For many, they are seen as the outcome of the end of the age of cheap oil, the inevitable result of the inability of a global economy addicted to oil unable to get its fix, and in particular a result of the oil price spike of July 2008, with speculators escalating oil to a high of $147 a barrel, a price at which, quite clearly, the world economy as we know it is unable to function." Read full insert. The new and improved website at www.transitionus.org launched last month marking the first phase of the development of the web tools for Transition US. The site features information on organizing or attending trainings, stories, resources and guides for Transition projects. Now that the first phase is complete, we're looking forward to developing the second phase! This next phase of the website will include more interactivity and networking capabilities with blogs and forums for discussion. It will also feature more advanced template pages for Transition Initiative listings in the US. If you have any suggestions or feedback, we'd love to hear from you! Read the latest blog entry from Jennifer Gray on the new film, The Age of Stupid. You can also get all the latest from Transition US on Twitter. If you are a muller, please take a couple minutes to help us learn more about what mullers need! Respond to our online survey to enter the raffle for a special Transition Initiative starter kit. This powerful and moving film shown on BBC explores the state of farming in the UK in the context of Peak Oil. Wildlife film maker Rebecca Hosking, who turned Modbury against plastic bags, investigated how to transform her family's farm in Devon into a low energy farm for the future. Read more. Post Carbon Institute is holding a Spring sale with special discounts on stock including copies of Post Carbon Cities, Peak Oil for Policymakers DVD, and the Oil Age poster. Visit postcarbonbooks.com.